A few weeks ago I wrote an article titled "Reasons why I think God exists". In it, I gave a very brief overview of just over 25 reasons why I think it's sensible to assert that God exists. On reflection I wonder whether or not it appeared to be the case that I put too much emphasis on fulfilled Bible prophecies regarding Israel. The reason it looked that way was because I started putting together my personal list of reasons when I was starting to look into the topic of Christian Eschatology. For a while, my proofs for God's existence merely consisted of a list of facts regarding Israel's regathering and over time I added other reasons that were not prophetically or eschatologically based. The Balfour declaration in 1917. The declaration of the independent state of Israel in 1948. The capture of Jerusalem in the Six Day War of 1967. The recognition of Jerusalem as Israel's capital in 2017. Ladies and gentlemen, in this year of historic visits and historic anniversaries, Israel has so much to be grateful for. One hundred and twenty years ago, Theodore Herzl convened the First Zionist Congress to transform our tragic past into a brilliant future by establishing the Jewish state. One hundred years ago, the Balfour Declaration advanced Herzl's vision by recognizing the right of the Jewish people to a national home in our ancestral homeland. Seventy years ago, the United Nations further advanced that vision by adopting a resolution supporting the establishment of a Jewish state. And 50 years ago, we reunited our eternal capital, Jerusalem, achieving a miraculous victory against those who sought to destroy our state. Theodore Herzl was our modern Moses, and his dream has come true. We've returned to the Promised Land, revived our language, ingathered our exiles, and build a modern, thriving democracy. In this article, I shall try to give a few more details regarding why I think God exists, expanding on the Israel-centric short headlines that I provided previously. I am not the only person to notice that Israel's regathering in 1948 seemed to be against all odds. Many Christians believe it to be the fulfilment of Bible prophecy and it has been discussed extensively over the years. For example, Dr Robert Newman gives a fantastic summary in his article "The Regathering of Israel", and there are other summaries available too. Focusing on eschatology, Mike Bickle gets quite enthusiastic in his articles. In AD 70 Jerusalem was destroyed by the Romans. This was because the Jews rejected Jesus as their king and therefore were left to their own devices. They were mostly expelled from the land and ended up residing in many countries until the end of the second world war. Hosea 3:4-5: For the Israelites shall remain many days without king or prince, without sacrifice or pillar, without ephod or teraphim. Afterward the Israelites shall return and seek the Lord their God, and David their king; they shall come in awe to the Lord and to his goodness in the latter days. I know of no other nation that was destroyed and then subsequently regathered after a long time. When nations are conquered, the people normally lose their identity and become the people of a different nation. In Luke 21, Jesus said that Jerusalem would not belong to the Jews any more until it has been trampled on extensively by other peoples. Luke 21:24: They will fall by the edge of the sword and be taken away as captives among all nations; and Jerusalem will be trampled on by the Gentiles, until the times of the Gentiles are fulfilled. Indeed, after 70 AD Jerusalem was conquered many times by many different civilizations. From the Byzantine Empire to the Ottoman Empire, Jerusalem was occupied by more than ten nations until 1948. It took two world wars for Jerusalem to become available to the Jews once again. In the first world war the Islamic Ottoman Empire collapsed and the region became the mandate of the British Empire. After the second world war, in which the Jews were nearly wiped out, they moved in large numbers to the land we now call Israel and declared an independent state. In 1967 they won a defensive war and took Jerusalem, thus ending the times of the Gentiles. "They will ... be taken away as captives among all nations": In AD 70 Jews were dispersed among the nations. "Jerusalem will be trampled on by the Gentiles": Jerusalem was conquered by other nations. "...until the times of the Gentiles are fulfilled": Some time afterwards, the Jews will be able to reclaim Jerusalem. This declaration, made in 1917, seemed to be quite similar to the various commands to rebuild Jerusalem that are described in Ezra (particularly chapter 7) and Nehemiah. The book of Daniel tells us that the specific timing of the command to rebuild Jerusalem was the starting point for a prophetic clock regarding the appearance of the Messiah and the destruction of Jerusalem, and for this reason Daniel chapter 9 is probably one of my most favourite passages in the whole Bible. Although no such weight is given regarding any possible future declaration, for me it could be prophetic or merely coincidental that many of the important events regarding Israel in the past 100 years can be counted in 10s from the original 1917 declaration - 1947/48, 1967, and now 2017. Isaiah 11:11: On that day the Lord will extend his hand yet a second time to recover the remnant that is left of his people, from Assyria, from Egypt, from Pathros, from Ethiopia, from Elam, from Shinar, from Hamath, and from the coastlands of the sea. This verse is pretty amazing in my opinion. Notice the emphasis on how this regathering is for the "second time", and that the people will be regathered from nations a lot further than merely Babylon. There has been a massive influx of Jews during and after the establishment of Israel in the past 100 years from many countries, including Russia - initially not very amicable to the idea. Furthermore, there are in fact dozens of Bible verses regarding the regathering of the Jews, each just as good as this one. It's something worth paying attention to. Jeremiah 31:8: See, I am going to bring them from the land of the north, and gather them from the farthest parts of the earth, among them the blind and the lame, those with child and those in labor, together; a great company, they shall return here. A few years ago my attention was drawn to a specific passage in Isaiah. It had such an effect on me I decided to take a closer look at other prophetic Bible passages, and it's fair to say that it is the reason why I am so interested in Bible prophecy today. Isaiah 66:7-8: Before she was in labor she gave birth; before her pain came upon her she delivered a son. Who has heard of such a thing? Who has seen such things? Shall a land be born in one day? Shall a nation be delivered in one moment? Yet as soon as Zion was in labor she delivered her children. 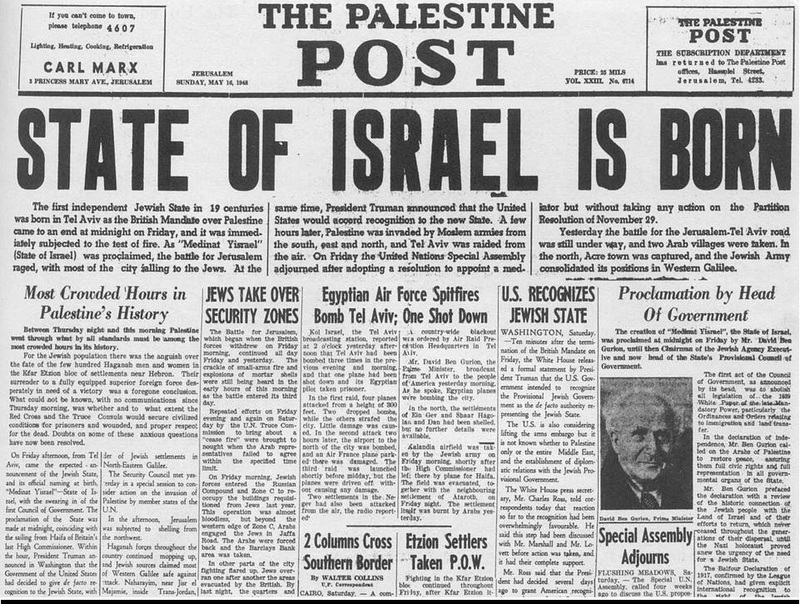 To me, the Jewish declaration of the independent state of Israel in May 1948 strongly corroborates this prophecy of the nation of Israel being born in a single day. The newspaper article describing this event even goes as far as to use the term "born"! Not only that, but a large number of countries including the United States worked to immediately recognise the new state. I don't know whether or not the newspaper editor was aware that by using the term "born" in their headline they were fulfilling Bible prophecy, but the sudden and immediate nature of the recognition of this new state is hard to ignore. Countries generally don't collude to fulfil Bible prophecy! In my opinion Israel's crowning achievement took place in 1967 when they fought a defensive war against a coalition of surrounding enemy nations and managed to take possession of Jerusalem. One of the most surprising facts about this for me is that this war only lasted six days, and ended on the Jewish Sabbath, as if such things could have been planned in advance. Possibly a minor coincidence, I'd agree. However, it doesn't change the fact that after this war, the Jews no longer considered themselves in a diaspora and for the first time in 2,000 years they once again owned Jerusalem. Israel was whole, and has been for 50 years. Jubilee years don't seem to be particularly important to us or the Israelites. They were very rarely celebrated. However, they are important to God, so if God himself ordains a time of celebration every 50 years and the Israelites ignore it completely, it does not mean that God also ignores them. I haven't looked into this in great detail, but I think that some major Biblical events occur in Jubilee years. I am willing to consider the possibility that the 50 year gap between the Balfour declaration in 1917 and the capture of Jerusalem in 1967 means that both events could have occurred in Jubilee years. Unfortunately, we do not know for certain which years are Jubilee years any more, and we don't know exactly how many days are in a Biblical prophetic year (for example, it could be 365.25, it could be 360 etc) but if these two events have occurred on Jubilee years then that gives us some sort of indication. And of course, the recognition of Israel's capital Jerusalem in 2017 is 50 years after 1967 and 100 years after 1917 - a reason to celebrate! Somehow against all odds, and mostly on their own, Israel has survived multiple defensive wars against coalitions of surrounding enemy nations and in fact has made gains in these wars. External support for Israel is a recent thing: Israel had no military allies until after the Yom Kippur War in 1973. Israel's survival is remarkable. It is not ordinary for Israel to have won as if there were no contest. Israel's enemies should have been victorious, especially considering their advantages. Yet despite all of this, it seems to me that God was involved and whenever God supports Israel, Israel can't lose. Despite existing for only 50 years Israel can be rightfully considered a first world country. It is a technologically advanced country with many skilled people who have transformed the landscape and the economy and the culture for the better. The regathering of Israel is such an historic event that God wants to be known for it, even more so than the original exodus of the Israelites from Egypt. Jeremiah 23:7-8: Therefore, the days are surely coming, says the Lord, when it shall no longer be said, "As the Lord lives who brought the people of Israel up out of the land of Egypt," but "As the Lord lives who brought out and led the offspring of the house of Israel out of the land of the north and out of all the lands where he had driven them." Then they shall live in their own land. According to Jews, the Messiah is destined to open the eastern gate of Jerusalem. Thanks to an Orthodox Jew amongst a group of Israeli commandos at the time, it is for this reason the gate was not demolished as part of a surprise attack in 1967. This is part of the reason why David Reagan from Lion and Lamb Ministries found the topic of Bible prophecy so captivating. It amuses me to think that the only thing that someone needs to do in order to significantly weaken the power of Bible prophecy is to simply go and open some gate, but of course I don't think it will happen. It could end up being a lot like when an earthquake coincidently happened to take place when there was an attempt to rebuild the Jewish temple before the time of the Gentiles was fulfilled. Zephaniah alludes to the language of the restored people of Israel, and thanks to great scholarly work Hebrew is now the resurrected, official language of Israel. Zephaniah 3:9: At that time I will change the speech of the peoples to a pure speech, that all of them may call on the name of the Lord and serve him with one accord. What is missing of course is the spiritual revival of Israel, a marvelous practical prophetic picture that God gives Ezekiel in Ezekiel chapter 37. So now I get to add another item to my list: 100 years after the Balfour declaration, an unusual United States president leads the way in recognising Jerusalem as Israel's capital city. As I said before, these are just my personal reasons. I've expanded on them here to try to show what I have been thinking, but they aren't supposed to be a complete, authoritative list. There are many other reasons to believe that God has been prophetically active regarding Israel in the past 100 years, and I'm sure we can now see that God will continue to be prophetically active in the future. God still has more to do regarding Israel and in the future, He will continue to fulfil Bible prophecy. Matthew 23:37-39: "Jerusalem, Jerusalem, the city that kills the prophets and stones those who are sent to it! How often have I desired to gather your children together as a hen gathers her brood under her wings, and you were not willing! See, your house is left to you, desolate. For I tell you, you will not see me again until you say, 'Blessed is the one who comes in the name of the Lord.'" Once Israel accepts Jesus as Messiah, He will return.